Musicians of the Philadelphia Orchestra went on strike Friday evening, minutes after they were scheduled to perform for an Opening Night gala at the Kimmel Center. The vote took place inside the performance center shortly before the event's 7 p.m. start time. Carrying signs and, for some, instruments, the musicians loudly made their way through the the center to Broad Street where they began to picket. A few of the musicians played their instruments as concert attendees filed out of the the hall. In a statement, the Philadelphia Orchestra Musicians said the strike is not a "greedy search for ever more money," but rather a stand for fair compensation. "Over the past nine years, we have endured multiple cuts to our wages, pension, and working conditions in the hopes that our sacrifices would give the Association time to rebuild and restore us to our proper status," the statement read in part. 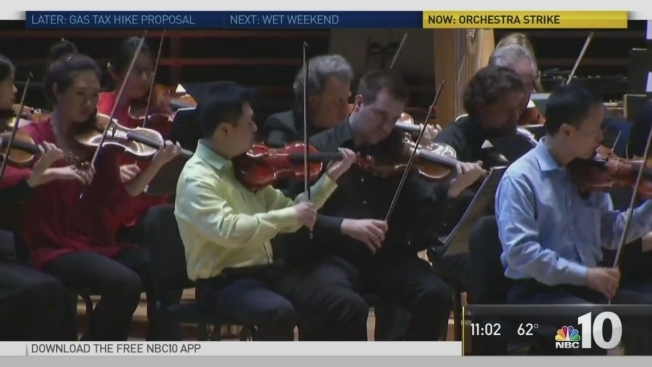 The Philadelphia Orchestra filed for bankruptcy protection in 2011 and emerged a year later. The 116-year-old institution is one of America's oldest and most acclaimed orchestras. Musicians were working on a one-year contract that recently expired. They continued to work as negotiations continued, but those talks broke down Friday. Under the orchestra's offer, musician's annual base salary would have been $127,608 a year with two percent increases for three years. A profit sharing fund would also have been created, officials said. The musicians union said they are compensated much less than players in comparable ensembles like the Boston Symphony Orchestra and San Francisco Symphony. Musicians from the Philadelphia Orchestra hold up signs after voting to strike on Friday, Sept. 30, 2016 inside the Kimmel Center for Performing Arts in Philadelphia. "If a talented musician has to decide between auditioning for Philadelphia or Boston or San Francisco, which orchestra will they choose?" the group wrote. "We can no longer remain silent while we continue in a downward spiral." Earlier Friday, the Pittsburgh Symphony Orchestra went on strike after rejecting a proposed 15 percent pay cut and pension and staffing reductions. The Philadelphia Orchestra's weekend performances have been canceled. Contract negotiations are expected to resume on Monday.